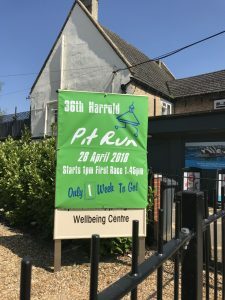 Harrold Pit Run will take place on Saturday 15th June. The Pit Run has historically taken place on a Saturday in mid-to-late April event. In 2019, Easter falls very late. With local schools on holiday from 5th to 23rd April., it became obvious to us that striking with an April Saturday would have a detrimental impact on the monies we could raise for local good causes, with holidays preventing some runners and stall holders from participating and/or preparing. We consulted wit parish councillors, church representatives, people from local groups such as the Scouts and Harrold Calvados Society, runners, marshals, sponsors, the organisers of other local events, friends, neighbours and more. With Bank Holiday and a school half-term week in May and the Odell Fete on 8th June, the overwhelming consensus is that moving Pit Run to 15th June is the best solution. We hope you agree. Here are the provisional results for all runners. The not registered runner label means that we could not identify a number for the runner. If you know it is you please let us know. Looking forward to running a stall at this much loved event. 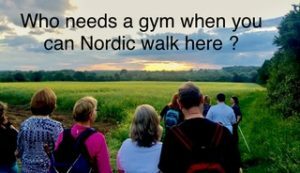 Come and have a go at our quiz Hear about all the health benefits nordic walking can bring you Hear about all the great walks there are on your doorstep. ‘Nordic Walking is a very accessible activity and something that can be shared by people of different fitness levels. It’s an ideal activity for people who haven’t exercised for a while or who dislike traditional sports or gym activities. An injured person can use the poles to support and guide, working to improve fitness as part of their rehabilitation. Athletes can use Nordic Walking for cross training and incorporate Nordic running. Community groups find it a sociable way to keep fit. If you’d like to shed a few pounds, then Nordic Walking is an enjoyable way to do this. It’s great for fitness enthusiasts who like to try new things. Whatever your age from 8 to 80+, you’ll probably enjoy discovering the benefits of Nordic Walking that improve your quality of life. This year it is possible to register teams online again after a change in the website did not allow it last year. There needs to be three in a team, the winning team is the fastest accrued time. There is a trophy for the fastest team. There are a few changes this year. 20% of your entrance fee will go to your chosen organisation. Also, if you wish you may make a donation to your chosen organisation whilst registering. Only for online registration, the pickup of race numbers has been extended to 1 hour before race start. The last remaining double numbers and a couple of entries with no numbers have been sorted out. A couple of runners passing finish without a race number or unrecognisable ones remain. This has allowed us to publish the team list. Please click on the links above the Facebook feed. Sorry for the delay, we have discovered the issue in the Main race results and corrected it. These are provisional results whilst we hopefully can sort out a couple of little niggles. A breakdown of the categories will appear shortly. Please click left above the Facebook feed.